Re painting a bespoke kitchen in Northwood, Middlesex. A fantastic project by Ryan in The North East transforming this vacuum wrapped kitchen. A recently completed Hand made kitchens direct kitchen in Cheshire. 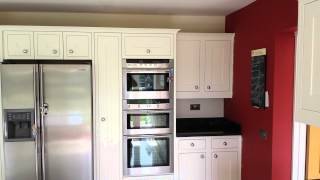 Kitchen rescue paint job in Glounthaune, Co. Cork. A oak kitchen transformed by Ryan Nicholson in Barnard Castle, Teesdale, County Durham. We can paint your existing wooden kitchen. We can paint your new bespoke kitchen. Almost any kitchen cabinet can be painted.